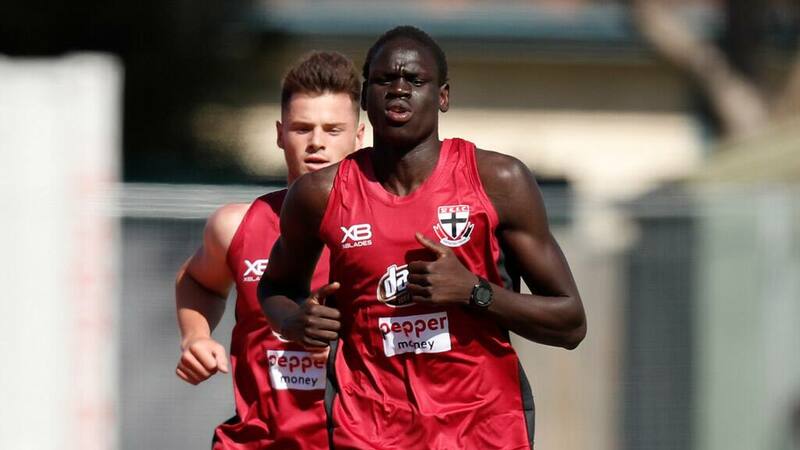 DRAFT prospect Tom Jok has taken out St Kilda's first time trial of its pre-season. Jok, 21, who played with Collingwood's VFL team this season, is training with St Kilda in a bid to be drafted. He lined up in the final seven games of the Magpies' season, impressing with his tank, athleticism and huge leap. Jok, who stands 193cm, also spent time at VAFA club St Kevin's Old Boys, winning the Premier Division flag. Wingmen Jack Sinclair and Ed Phillips rounded out the top three of the time trial, which featured the first-to-fourth-year players. Meanwhile, young gun Jade Gresham declared he was prepared to commit to the Saints long-term. Gresham comes out of contract at the end of 2019 and is the No.1 priority for St Kilda to re-sign. Asked whether he saw his future at RSEA Park, the 21-year-old answered in the affirmative. "Definitely. I love the club, love the players. I'm mates with a lot of the boys so I'm sure something will get done," Gresham told reporters. Saints list manager James Gallagher told AFL.com.au in October he wanted to see a deal done, but would have to wait for Gresham. "We're really keen to extend that out. We've initiated discussions with Jade's manager," Gallagher said. "At this stage, he wasn't keen to do that this season, but we'll stay in regular contact. "He's been terrific for our footy club. I think we've been terrific for him so we're really hopeful in expecting it's going to be a long-term relationship with Jade and he can be one of the really good players in St Kilda's history." For the man himself, it hasn't been front of mind as he spent his off-season in Bali and Europe. "I haven't really given much thought into it over the off-season, to be honest. I just wanted to refresh and have a bit of a break," Gresham said. In the past, Gresham has done most of his work up forward. He booted 35 goals this year to win the club's goalkicking but is set for a move. "Hopefully this year I'll do a lot of work in the midfield and hopefully get a full pre-season, which I haven't really had since I've started," Gresham said. Improving his endurance will be a focus. "I've definitely got a lot of improvement in me, especially with my running, so I'll latch on to a few of the older boys and train with them," Gresham said. Former Swan Dan Hannebery will be one he will look to learn from. The triple All Australian was back at training on Wednesday, a fortnight before he was due to return. "He's obviously come back a bit earlier, which is awesome. I'll definitely hang on to him. He's obviously been around a pretty successful club, so I'll pick his brain and hopefully can train alongside him," Gresham said. After a disastrous 2018 which saw St Kilda finish 16th, Gresham is determined to see his side rise up the ladder. "Obviously we didn't have the year we wanted last year, which was a bit disappointing. I've got a lot of confidence in us. We're going to have a big pre-season. Hopefully we can turn that around."